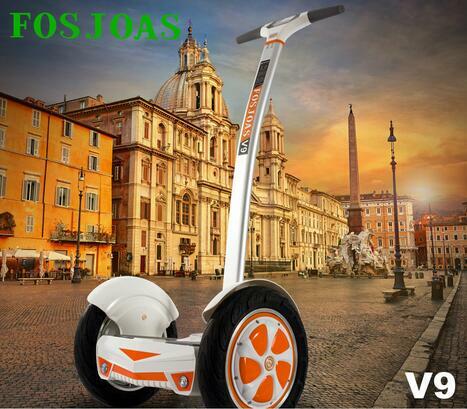 Recently, Fosjoas intelligent self-balancing electric scooters become more and more popular. At the same time, they also have received wide approvals from people. However, Fosjoas is a big family and owns many members. The one that will be shared today is V9, a two wheel self balancing scooter. V9 is a high-end scooter type of Fosjoas family. Compared with electric unicycle and twin-wheeled electric scooter, it enjoys much more comfortable riding experience, which benefits from two aspects. On the one hand, it is two-wheeled design and thus it doesn't need riders to keep balance by four limbs. Riders can stand on it easily. On the other hand, relying on aerospace attitude control theory, fuzzy software algorithm and gyroscope system, Fosjoas V9 two-wheeled electric scooter can keep balanced by itself, which also paves the way for easy riding. Riders can realize many controls, like moving forward, speeding up, slowing down and changing direction, by adjusting body gravity. For example, if riders lean forward slightly, Fosjoas V9 will move forward automatically. Besides comfortable riding experience, riding Fosjoas V9 two-wheeled electric self-balancing scooter is really enjoyable. It is equipped with a closed stereo with high quality music experience. In the meantime, Fosjoas V9 can be connected with cell phone and play melodious songs inside it. It is really cool when riding V9 and listening to loved music at the same time, which makes travel light-hearted. Besides, Fosjoas V9 is powered by 520Wh Japan-made lithium-ion battery that supports as long as 50km if fully charged. In other words, people absolutely can ride it to take a one-day trip on weekends and relax themselves. The life with Fosjoas V9 electric scooter will be full of pleasures. More importantly, it is a transport that is designed for all travel purposes and can take people to do anything and to go anywhere.